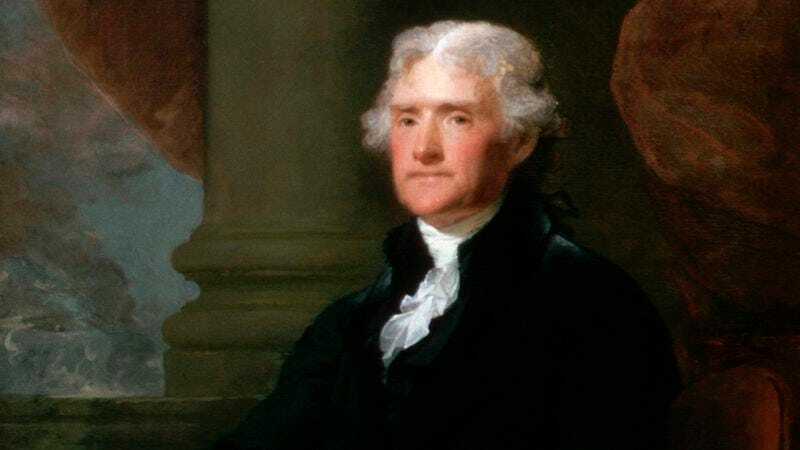 CHARLOTTESVILLE, VA—Lending credence to widely circulated rumors about the third president of the United States, historians announced Monday the discovery of journals that suggest Thomas Jefferson may have clandestinely fathered several other countries. “There was always speculation that Jefferson had actually sired a number of independent nations, and these documents found at his estate, Monticello, provide evidence that he was indeed a Founding Father of more republics than just the one for which he’s known,” said University of Virginia professor Sarah Gilden, adding that at least a few of Jefferson’s secret countries are believed to be in the Caribbean. “Entries from the journals seem to indicate that Jefferson begot countries from a number of territories he visited during trips abroad, countries that most likely had no knowledge that they were in fact half-siblings of the United States. Whether Jefferson was aware of the countries he himself fathered is unclear, but given his prominence in American life, he certainly would not have wanted it made public.” Experts have also concluded that while not all the countries fathered by Jefferson have been confirmed, it may be possible to identify them from a shared set of debilitating defects.